We live in an energy-filled universe of angelic existence. They move from the celestial (eternal) realm to the terrestrial (time) realm apparently at the speed of light. God has been pleased to make known a considerable amount of information regarding their creation, sin, mission and ultimate destiny. 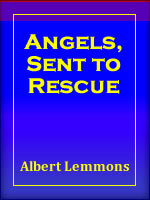 As the title of this 12 lesson CD/DVD series suggests, angels are not our savior, but are sent by our Savior to assist, minister to, and guide mankind. In doing so, angels help us achieve a potential eternal position never to be enjoyed even by Michael or Gabriel.